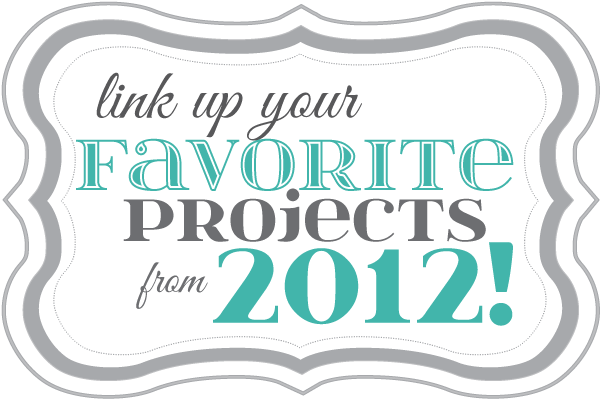 Link up YOUR Favorite Projects from 2012! Wow – I can’t believe it’s already 2013!! 2012 was such a creative year. I LOVED seeing all of the amazing projects that all of you made this past year. I thought it would be fun to have a link up where YOU can share your favorite projects. And I will do a couple features, spotlighting YOUR favorite projects from 2012. So link them up!! You can link up one, or more of your favorites! I can’t wait to see YOUR favorite projects from 2012!! And, I have a special giveaway for ONE of you — I will draw a winner via Random.org. Weekend Wrap Up Party — What was YOUR favorite project of 2010??? sorry I’m a little late. thanks for the awesome party! Happy New Year! Thanks for hosting, we had a great visit! Thanks for hosting so many wonderful projects compiled here! Great link party! Love seeing everyone’s favorite projects! Thanks! Love that you are doing a linky party! I linked my ‘Thanksgiving Fall Wreath’ I used one of your tutorials to make the fabric flowers for my wreath! Now onto checking out all the other fabulous blogs that are linked up! Jen, Thanks for hosting such a fun party! It will be fun to look through some of peoples favorite posts of the year. Happy New Year! I have linked up to the party and look forward to visiting some of the other links. Thanks for hosting. Thanks for hosting! What a year! Happy New Year to you! Hi Jen, I haven’t done many link parties lately, but I felt compelled to do this one because you were actually my inspiration for one of my projects this year…*hint*…Ikea rug ;). Thanks for hosting and I’m looking forward to checking out all the fabulous blogs! Thanks for commenting Doreen!! I am so happy to have you link up. I am so excited to see your rug. Yay! Happy 2013!! Happy 2013 Jen! Can’t wait to see what you have in store for this year!! Jen, you bring out the best in people! Thank you for hosting this party and for always inspiring all of us! Happy New Year to you! Richella — Thanks sweet friend. You are amazing. Thanks for linking up! So much fun! Thank you for hosting this amazing linky party and Happy New Year! Looking forward to the new projects of 2013. Thanks for hosting Jen!! Wow – wonderful inspirational posts linked up here! Happy New Year – all the best for 2013!!! What a great selection of projects! I enjoyed browsing so many of them. Thanks for hosting Jen. It’s fun going through the links to see everyone’s favorites! Thanks for hosting the special party Jen! Ilove seeing all the awesome ideas people link up each week at the Weekend WrapUp and am loving looking through this “best of” series! Happy New Year! Thanks for hosting, I love seeing what everyone was up to last year! All linked up– bringing my A game this round Jen! 🙂 Got some top posts w/ a side of my top Dance Video- yep — have you seen it? Oh… you may want to hit the bathroom before you watch it! 🙂 Happy 2013 lady and thank you for the big smashing party! Haha! You are so cute Jen!! Thank you so much for hosting, Jen! You had so many great projects this year! Awesome! Thank you for this opportunity – can’t wait to try some of these projects! I love looking at everyone’s best! Thank you for hosting. Thanks for having this fun link party Jen! What a great idea. Oops, I’m a little late to the party. Thanks for hosting and have a Happy new Year! Happy New Year to you Jen! Thank you for hosting! Happy New Year, Jen! I am sooo excited for 2013…Have a great week! Happy New Year! Looking forward to new creative inspiration at your fun parties! Happy Happy New Year Doreen!! Thank you SO much for hosting, Jen! Have a happy New Year! Happy New Year to you Crystal!!! Thank you so much for hosting Jen. I hope you and your family have a blessed New Year! Happy Happy New Year Marcie!! Happy 2013 to you Tanya!!! Happy New Year!!! May our dreams and wishes for 2013 all come true. Thanks for this opportunity to link up. I love looking back at what I have done, it is a good way to get in the right set of mind for starting a new year. Oh Marianne! I adore you. Thanks for linking up. I know 2013 is going to be an amazing year for you! Happy New Year to you Britni!! Thanks for linking up Chelsea!! Happy 2013 to you!! Happy New Year Jen! Thanks for hosting! Leanne!! Love you my friend!! Happy New Year to you!! Will I see you in Anaheim next week? Love you too Heather!!! Yes!!! I am so excited to see you. Yay!!! Oh yeah, I think I am staying with you. HAAHAHAH. XOXO — so excited to see you!